A paper wallet is an offline mechanism where you can simply print a public key and a private key together onto paper, plastic or even metal. These physical wallets, also regarded as “physical cryptocurrency” are considered to be one of the safest ways to store cryptos’ offline. With proper construction and the necessary precautions, the paper wallets remain protected against any hostile users. Numerous images of innovative paper wallets are seen on the web involving unique print of both public key and private key. Numerous cryptocurrency experts have branded paper wallet as one of the most secure ways of storing cryptos offline. The paper wallets guard the cryptocurrencies against any form of malware, cyber-attack, and other threats. These physical wallets involve “printing” of the public and private key and storing them in a secured offline mode. However, you need to understand that you are not printing an actual digital currency on paper but only the crypto information that is originally stored in a digital wallet or crypto wallet. The data printed on paper includes the public key aka wallet address that allows users to transfer money into the wallet and private key which provides access to the funds. Hence, the cryptos are not stored offline, only the relevant keys are. With advancing technology, the chances of hacking are also imminent. There have been recorded cases where exchange accounts have been hacked, digital wallets breached and user smartphones being stolen or even destroyed. But a physical paper, plastic or metal is impregnable from any kind of digital attack. Though they are not entirely foolproof, paper wallets are vulnerable to water damage, fire, and even theft. 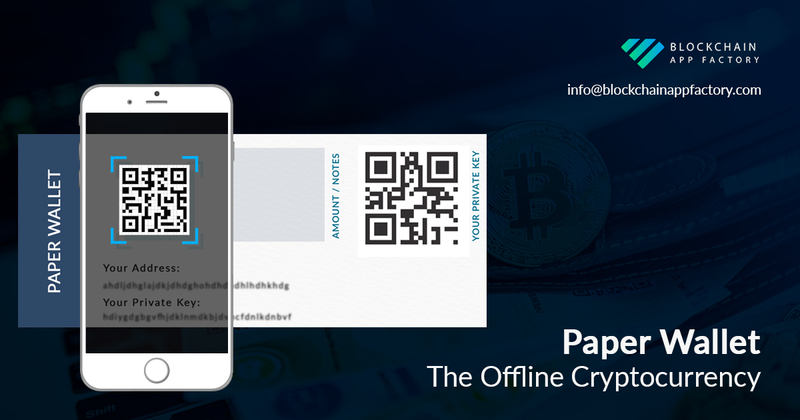 But, with necessary precautions, these offline paper wallets are one of the safest ways to store cryptocurrencies. There are numerous open-source wallet generator websites such as BitcoinpaperWallet.com, BitAddress.org, and WalletGenerator.net dedicated to creating a paper wallet within seconds before printing it. The information regarding public key and private key are printed on paper in QR form. Paper wallets can comprise unique designs that users can fold, cut or even seal, making them a secure form of offline crypto storage. A word of advice: Users are encouraged to unplug their internet while generating the key and wipe their history clean post key generation. Though experts recommend using a brand new computer during key generation for avoiding malware, nevertheless for feasibility, users are advised to run a malware check on their computer before key generation. There are third party companies offering “cold storage” services like storing the printed crypto wallet in their safe vaults present at disclosed or undisclosed locations. The financial service industries, however, do not regulate these companies but remain insured against theft. Paper wallets are a unique form of “cold storage” that offer enormous security against digital hacks and breaches. Users remain less vulnerable to malware and cyber attacks since the keys are present on physical paper which removes the involvement of digital footprint.